Google’s Street View software and now-infamous bubble trucks are nifty, but old hat when it comes to virtual mapping. The newest craze: mapping nifty spots on the globe yourself. The company created its 360-degree Photo Spheres panorama option back in October 2012 for stock Android phones; since then, it’s earned a place within the Google Play store and as of Tuesday, a spot on iOS. Naturally, we had to take Google’s new Photo Sphere Camera app for a spin; here are some early thoughts. 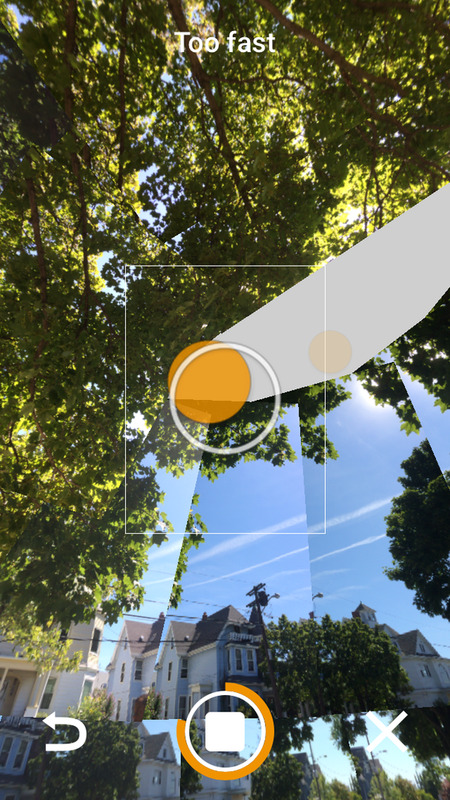 Like many of Google’s other iOS app offerings, Photo Sphere Camera is sleek and speedy, mirroring the Android-influenced design found in the company’s other programs. Upon opening the app, you’ll have to grant Google access to your location (surprise, surprise); once you do, you’ll see several vertical tiles on the screen. One presents your current location on a map (along with the locations of any finished photo spheres), while others display sample photo spheres. Creating a Photo Sphere is simple enough if you have a few minutes to spare. Tap the orange camera button, and you’ll enter a gray screen with a floating orange dot. As the app so helpfully guides you, line that dot up with the white circle in the center of the screen; once you do so, your first picture appears. From there, you’ll be prompted to find and match subsequent orange dots—the closest thing you’ll get to a tiny five minute mini-game inside of a photography app. As you initially fill up the gray screen with photos, don’t be alarmed if your sphere looks choppy or otherwise poorly lined-up—Google’s magic stitching meeples will go to work once you’ve finished taking your panorama. You can end your photo sphere at any point by tapping the stop button, undo an image by tapping the undo button, or close without saving if tapping the X. When you finish a photo sphere, Google turns to processing. A single Street View meeple appears during the loading screen, meticulously hanging and straightening white squares in a line. When it’s done, you can preview your new, (mostly) seamlessly-stitched sphere. You can view your new photo by scrolling around or by tapping the compass button to use the accelerometer to turn your device around the scene. You can save your finished photo spheres as flat images to your camera roll. 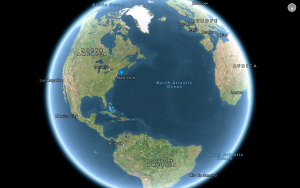 The flat version of the sphere is automatically saved to your Camera Roll, but to share the actual curved scene, you need to publish it to Google Maps. There’s no option to publish anonymous spheres—you have to link both your Google+ account and your location data. For those who would prefer that the location of their sphere be a little abstracted (say, if you don’t want to have a location from your house published on the internet), you can tap the map below your finished sphere to edit the location. The app also offers a simple settings section that lets you turn off geotagging of photo spheres altogether, though you won’t be able to publish them to the Web until you set a custom location. There’s also a switch for saving flat spheres to your Camera Roll, only uploading spheres to Google via Wi-Fi, and setting the resolution of the finished photo.